What Can We Learn From Surfers? May 31, 2013 in Sports Stories and Principles, What Can We Learn From... ? I’m happy to admit it, I’m not a surfer. My pale complexion and complete lack of swimming ability has kept me on dry land whenever possible. However, I can see the appeal of surfing. Those well-tanned, buffed men and women who have an affinity with the ocean waves are heroes to many and I have few friends (although they’re neither well-tanned nor buffed) who love to surf as a hobby. When done well there are few athletic feats more poetic, powerful or graceful than a surfer riding a great wave. I wish I was that cool! 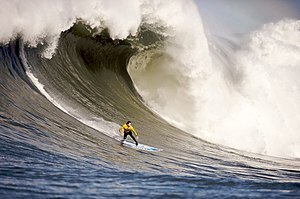 In considering the art of surfing, I think that there is a very important principle that we can all learn from surfers. You see, despite the talent, experience and proficiency of the surfer, every time they stand up on a board, he or she is virtually guaranteed to fall. In the search for the perfect wave and the perfect ride, surfers fall off many, many times. Some of the most spectacular falls come after the most incredible rides. It almost seems cruel, that such a feat can be followed by arms and legs flailing through the air at all angles. But that’s the way of the surfer. He can sit safely on the beach and be envious of those who are risking their health on a board. Or she can take a deep breath and start paddling, in the knowledge that she is virtually guaranteed to be unceremoniously dumped at some stage. This is the lesson that I have learned from surfers. That to do anything that’s worthwhile will involve risk, pain, falling, looking ungraceful and being at the mercy of the waves. If you sit on the beach watching, you’ll never achieve anything of significance. Of course, for all of the falling and splashing around, there are those moments when it all goes right. When the surfer seems to float effortlessly across the sea, when board and wave are one. In that moment of intoxicating glory, all of the previous falls are forgotten. And at the end of the ride, the surfer paddles back to the ocean to find a few more seconds of ecstasy. Because it was a heck of a ride. And that’s the way life is meant to be. I so needed that today!!!!! Great analogy!!! It’s totally perfect for your message 🙂 Another winner, Darren!